In Darham, promises mean everything; once you make a promise, you are bound by it. Breaking a promise will leave a scar and turn you into an outcast. 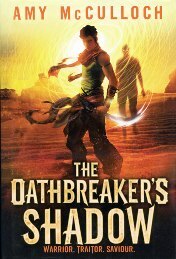 Raim, a fifteen-year-old training to become a member of the elite Yun guard, has worn a promise around his wrist for his entire life, but he has no idea what that promise is. Raim sets off on a quest to uncover the promise: will he succeed?